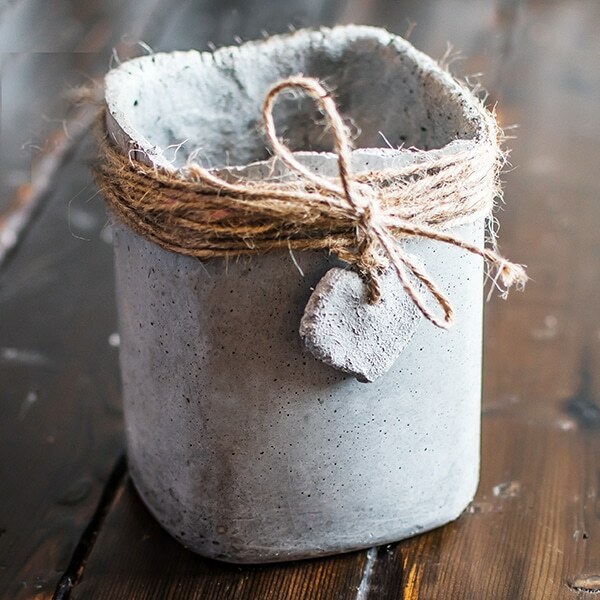 Ok, are these concrete pots not the cutest things? 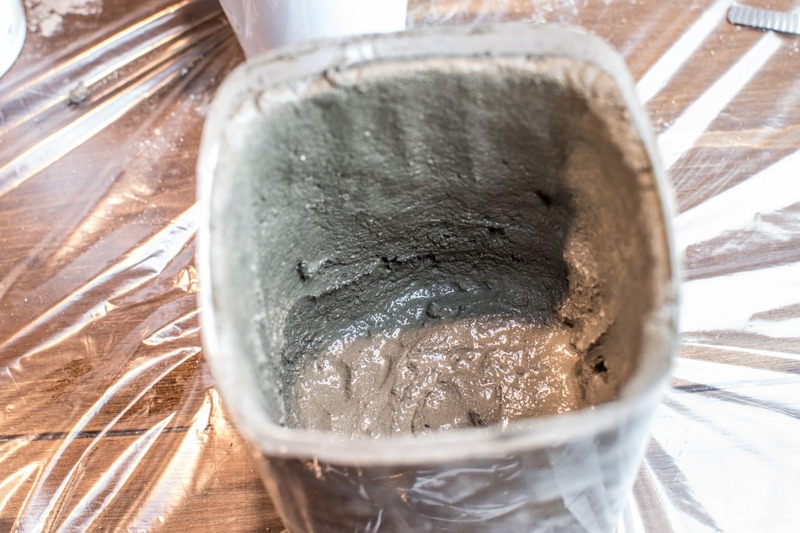 During one of the countless trips to the hardware store during our (still not completed) bathroom renovation, I saw this bucket of shapeable concrete on the shelf. It said “shapes like clay,” and I was all “oh really!”. into one of our orders and tucked it away for some night when we were bored, and I needed something made out of concrete. 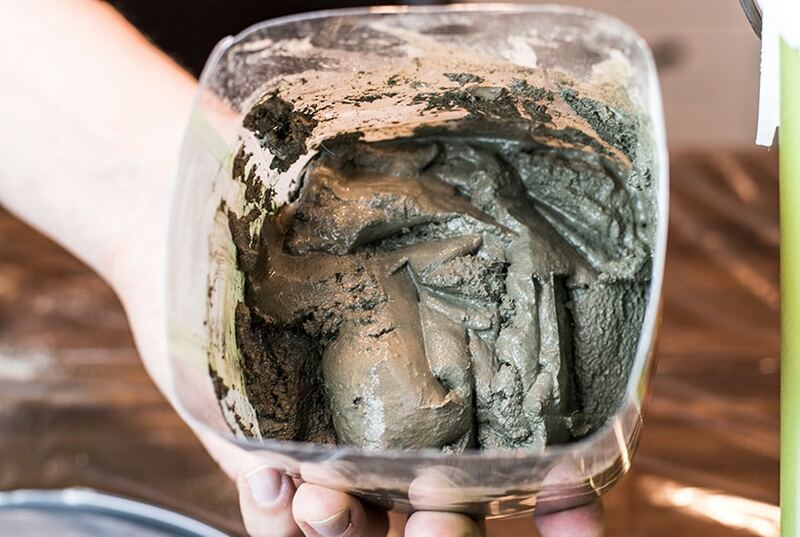 It’s concrete that you can pour like regular concrete, but it also can be used like clay. That was the appeal to me. I love working with clay, and I’ve been coveting a kiln for years. When I find a product that doesn’t require high heat to cure, I am all over it. When we got home from the hardware store, my husband was perplexed at how I managed to get a 5-gallon bucket of concrete mix into the order without him noticing. Skill honey, it’s all skill.
. I saw these cute little herb pots when I was searching Google, but the seller no longer carried them. They looked easy enough, a bit of a concrete and some twine I and I figured I could recreate them. I have an herb garden on my windowsill, and up until now, I had them in ugly green plastic nursery pots. I know, the horror! 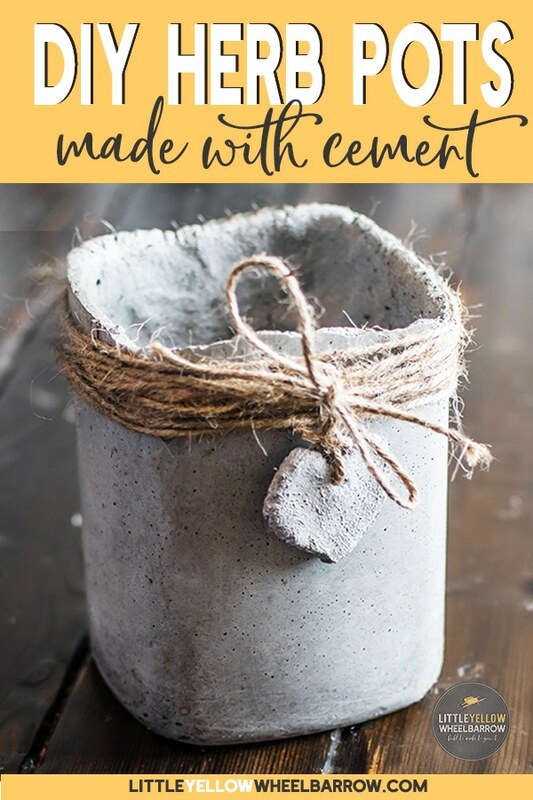 I decided to try to make one of these cute concrete pots to see how the clay worked up and what kind of finish I would get when it was it was dry. If it the worked the way I wanted I could make enough for all my indoor herbs. So a few safety tips. Wear a mask. The particles become very airborne, and you don’t want to be breathing those particles into your lungs. Once the product is mixed, you do not need to continue to wear the mask. Also, wear gloves. Or you will be trying to get concrete out from under your nails forever. Don’t ask me how I know. We didn’t have a commercial mold for this project either. My fancy schmancy mold was a recently emptied plastic orange juice container. Since the container was square(ish) on the bottom, I thought It would work up well. The dimensions were 5.5×5.5 and I cut the top of the OJ container to make the mold 7 inches high. The clay can be pressed against the sides and built up. I found that you had to get the right consistency of clay to water. Shapecrete recommends three parts mix to one part water for their clay, but I found I had to add an extra 1/2 cup of mix to get the structuring right. I added a cup of the mix to the mold worked it with my fingers to create the bottom. I kept adding the clay concrete in 1/2 cup increments. I used my fingers to work the concrete against the sides of the mold. I kept working this way until the sides of my pot reached the top. I kept my concrete 1/4 inch thick all the way around. Make sure you put a hole in the bottom of the planter. I just pushed a finger down ito the mould and moved the clay out of the way. It worked perfectly. 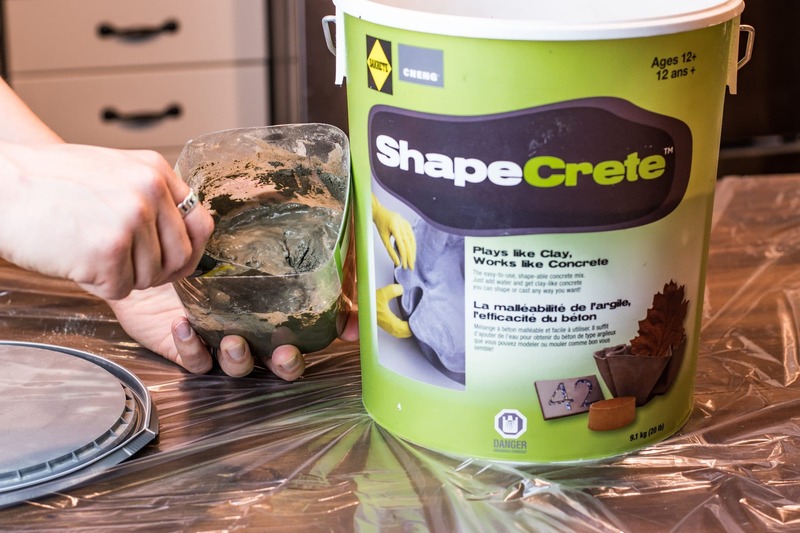 Shapecrete claims that its product is workable for 30 minutes. I have no idea if that is the case because I was able to work up the sides and create my concrete pot in about 5 minutes. I wanted a nice smooth edge to the top of my planters, but I could not cut, or trim the concrete the way you can cleanly cut clay, so I just left it rough. You can sand your concrete pots after they cure, but we warned it’s tedious work. 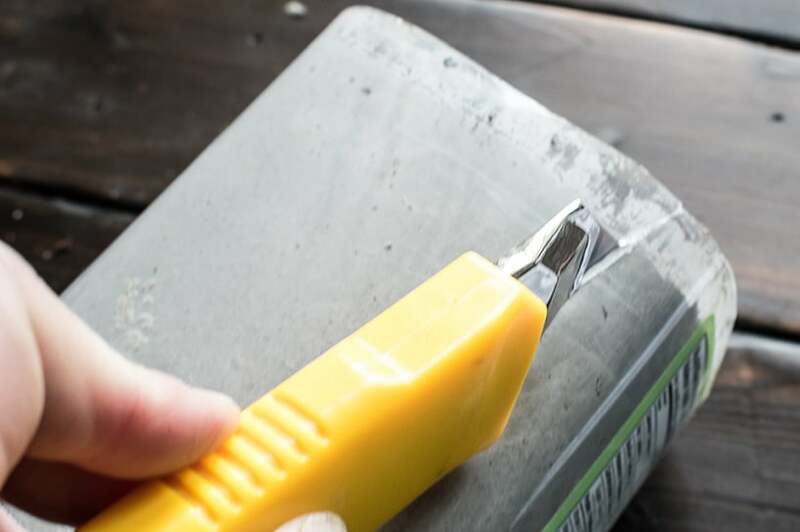 How to cut shapes in your concrete clay – or at least how to attempt to cut shape in your concrete clay. 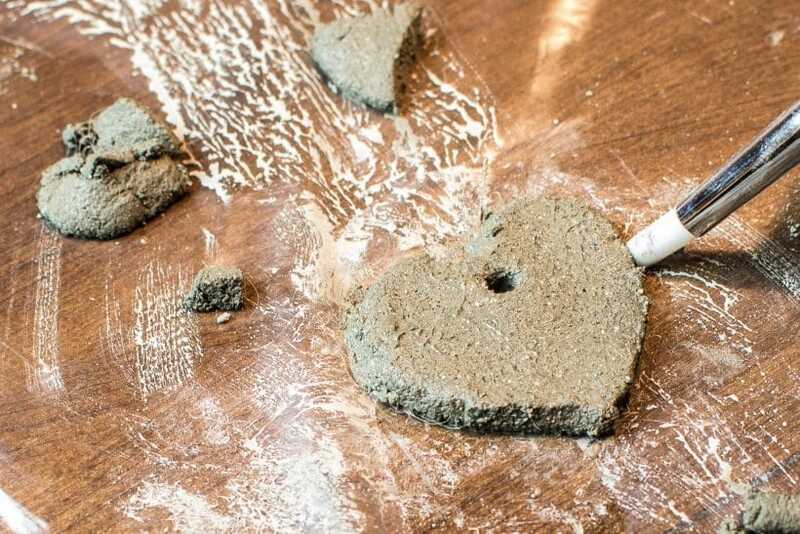 The herb pots that I tracked down on google that no longer existed had a sweet little heart trinket on the front made out of concrete. I liked that touch and felt that it added a bit of dimension to the concrete planters. Cutting out the concrete was not an easy task. I sacrificed a small heart-shaped cookie cutter for the project. It didn’t work very well. Since the concrete clay has tiny rocks, bits of fiber and isn’t smooth like clay, it just wouldn’t cut through cleanly. I was able to shape and clean up the edges a bit with just a small silicone tip tool that I used to push the concrete around. Once I had a shape that vaguely resembled a heart I used a dotting tip to create the hole. My heart trinket dried rough, really rough! I didn’t like the smooth back surface because it had a lot of bubbles, and the front was very textured. I decided to use it anyway even though it didn’t turn out the way I wanted. Once it was on the concrete planter, I didn’t even notice how rough it was. Don’t you hate it when your partner says “I told you so”… ugh, infuriating! I waited the recommended 24 hours for the concrete to cure. I used a utility knife to notch the plastic, and with a simple pull, it ripped down the side releasing the planter. I went crazy for the surface. It was incredibly smooth! Exactly what I wanted. The plastic orange juice container gave it the perfect surface to create a nice smooth texture. I did have a few bubbles here and there. I know you can work them out with vibration, but that wouldn’t work given how the sides of the planter were built up vs. poured. I can live with them; they add a nice touch. You can see in the photo below how smooth and shiny they were when I pulled back the plastic. So, concrete isn’t exactly the best for plants. It creates an alkaline environment which most plants will not enjoy. # 1. You can soak your planters in water for a few days, which will leach out much of the alkalinity. # 2. 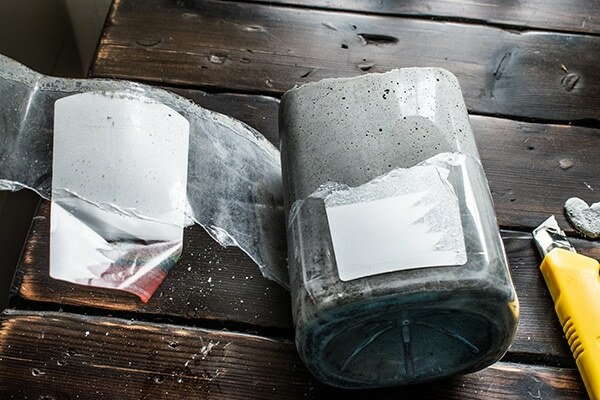 You can add a plastic container that fits inside the concrete pot. Although I love the concrete texture and look of the pot, I don’t want to grow something in it that I am going to eat so I opted for #2 and added a small plastic nursery pot. The ShapeCrete website does state that the product is suitable for herbs but it does recommend a soaking period prior to adding your plants. So what did I think about Shapecrete? at all. I found that it never actually worked up like clay the way I thought it would. Although I didn’t enjoy working with the medium, I did love the final product. I have to say it again, the surface of this little pot was surprisingly smooth! I am looking forward to the next project already. Even though the medium was difficult to work with the final results were great. Are there any concrete projects you are curious about or want to test? Let me know in the comments! 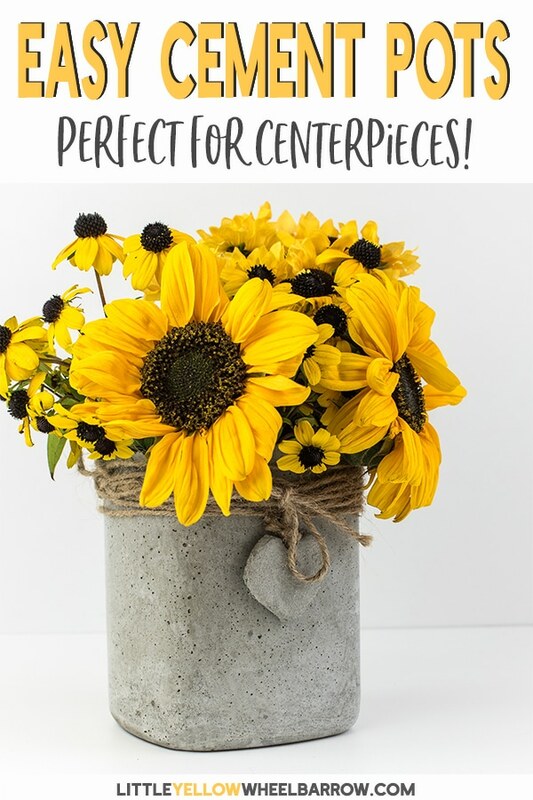 Oh and side note, these concrete pots make really cute centerpieces. 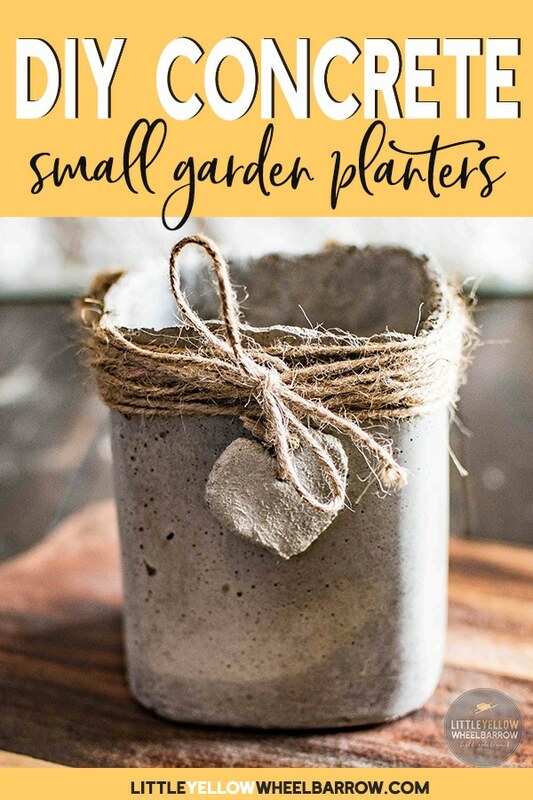 If concrete isn’t your thing, I have these scalable wooden hanging planters that are super easy to make or these wooden window box planters. We also have these pretty clay craft flower vases that would look beautiful planted with a bounty of herbs. « A Rustic Style Home Command Center Perfect for a Small Space. What is the herb you have in your concrete planter? Hi Kathy, that’s a rosemary plant. I grow mine inside because our climate isn’t best for them to be outdoors over winter. Cheers! Great job! Really appreciated your being honest with how you felt about working with the product. Hi Laura, how did you get your planter so shiny and how do you prevent cracking? I believe the smooth surface of the plastic container created the shiny surface. I didn’t have any cracking, and I didn’t do anything specific to prevent it. I am sure that is not at all helpful, but I honestly just followed the instructions and stacked my clay against the wall of my container. I also made a 20×20 inch clock with ShapeCrete – I did not reinforce it. The clock is 3/4 inch thick and it did not crack while curing. Even when we drilled a hole into the center after it cured, no cracking. It held up perfectly. Is ShapeCrete the same as hypertufa? I just made some hypertufa pots using your same technique. Ingredients are Portland cement, perlite and peat moss. I’ve tried hypertufa before, but I never managed to get a super smooth surface. Unlike the peat moss in the hypertufa, Shapecrete has tiny fibers which vanish when the product is cured. No pearlite in Shapecrete either, but I did read that pearlite, as well as peat moss, can be added to make hypertufa. Same idea, similar results, different finish. I would say they are very similar but have their pros and cons for various applications. Cheers!